Worth the hype? Deciem, The Abnormal Beauty Company! This post is long overdo I know! This so far has been one of my most requested post this year. I don’t blame you all for being so curious about Deciem! This cruelty free Toronto based brand is so popular among millennials that their “The Ordinary foundation” had a 25,000 person wait list! That is insane! Their packaging is no fuss, simple, clean and to the point. Deciem “the abnormal beauty company” as they lighthearttly call themselves introduced their current line of serums and foundation under The Ordinary umbrella to major success! This line introduced high coverage foundation for $7 and serums for under $15. How do they do this and do the products work? The founder Brandon Truaxe explained that because of the low number of ingredients in each product, it is possible to produce and sell affordable skincare to the masses. Of course I was intrigued so I placed my order as quickly as possible. I waited 5 weeks for my products to be shipped because the company was out of stock…hello wait list ! Fair enough. I wanted to get my hands on these foundations that some were saying online could be considered life changing. Really..life changing? Well I had to see for myself so bring it on Deciem! 100% Plant -Derived Squalane is a hydrator which is found naturally in the skin. You would use Squalane if you want to increase hydration or prevent depletion of hydration in your skin. You can also use this product on your hair to prevent breakage and add shine. My thoughts: I found that the Squalane did a great job ensuring my skin stayed hydrated. I was so surprised that the Squalane only had one ingredient listed .. Squalane!. That’s all there is to it. It doesn’t get more simple than that. I used it every day before I applied my moisturizer. I found the best way to apply this emollient is to place the dropper directly on your face, but not touching your face. Applying the product on your hand first, I found, was wasteful because it has a runny consistently and is absorbed quickly into any surface it touches. I only have a bit left in the bottle so I placed an order for 2 more bottles. Argireline Solution 10% is clear lightweight Serum with 10% Argireline Peptide Complex. Argireline benefits the areas on the face that are prone to folds (wrinkles!!) such as eyes and the forehead area. To use, apply a few drops on the forehead and around the eyes twice daily. My thoughts: The solution feels like water on the face. It’s extremely lightweight and odourless. I was skeptical at first because I have never tired a serum that basically looked like water but I was assured that it wasn’t water. In one and half months time I had used up the whole bottle as I used it religiously every morning ( before the Squalene in the morning ) and night. I can’t say that I see a dramatic difference in the minor crows fee that I have around my eyes but I do feel it has diminished them slightly. I believe if I had another bottle of the Argireline Solution 10%I would have seem a greater difference but I didn’t plan ahead of time to order a bottle. I am now awaiting my 2nd and 3rd bottle to arrive! At $8 per bottle it’s so affordable to give it another chance. High-Spreadability Fluid Primer is from the Ordinary Colours line under Deciem and is made up of high flexibility silicones that help hydrate the skin and give an overall dewy look. Used as a makeup primer it ensures long lasting makeup wear and Ordinary Colours claims that this primer helps spread your makeup evenly to avoid blotchiness. My thoughts: My first reaction was ” holy heck this is good”! It took me a few days to understand why I loved this primer so much. It’s almost identical to this staple primer that I use on myself and my clients for $36 less! You better believe I ordered another 2nd , 3rd and 4th bottle. It’s perfect on the skin. It does exactly what it claims to do. It smooths your face and ensures your makeup lasts through out the day. As for the claim that it helps disperse complexion makeup evenly, I can see some truth to this definitely as it’s a very light weight formula that smooths out the texture of your skin allowing the makeup to glide on smoothly without the need to tug or pull to get the desired effect. The only negative feedback I have on this primer is not about the product itself but the drop dispenser packaging. I wish at some point Deciem will decide to package it in a squeeze tube instead of a dropper. It’s not easy to dispense. Overall this product is definitely worth $8 ! I can’t stop raving about how much I love it. The Ordinary Lightweight Serum Foundation shut the internet down! This $7 bottle had a 25,000 person waitlist as well as orders for 250,000 units it’s first week of launching and literally crashed the Deciem servers! It offers lightweight coverage but buildable to sheer-medium coverage and is formulated in a way that allows the pigments to look natural on the skin, serum like, and this does not settle in fine lines. It has a matte finish and works extremely well over any primer offered by The Ordinary. Only in Europe is this foundation available with SPF. This foundation and all Deciem products actually, are free of parabens, sulfates, mineral oil, animal oils, coal tar dyes, (WTF?) and a bunch of stuff I’m too lazy to type out…but honestly just trust me when I say your face will thank you for omitting junk from your makeup! The Ordinary Colours offers this foundation in 21 shades divided into 3 categories. I strongly recommend you visit their shade guide for a comprehensive breakdown of shades as well as swatches. My thoughts: Every woman should have this serum foundation in her makeup bag for the days/nights she wants to feel good and natural in her own skin ! They are 100% right to claim this looks serum like on the skin. The foundation comes in a plastic bottle with a pump for easy application. I apply The Ordinary Fluid Primer first and then I use about 1.5 pumps worth of serum foundation on a damp beauty blender to achieve the coverage I’m comfortable with. I ordered 2.1Y which I find is a good choice for the Summer months but once my tan fades I know I will have to go at least a shade lighter. Every time I wear this foundation I am guaranteed over 7 hours of wear. It looks natural on the skin so if you have imperfections you want to hide, it would be a good idea to conceal those first before applying this foundation. If you are looking for a soft conceal of imperfections than you’re good to just use this foundation alone. For those that have oily skin you may need to touch up with some powder once through out the day but that’s probably after 6 hours of wear. The Ordinary High-Coverage Foundation offers a semi-matte finish with more pigmentation than the serum foundation therefore provides more coverage yet still does not feel or look cakey on the face. My thoughts: I don’t wear this foundation as much as I do the Serum foundation only because I am, knock on wood, having really great skin these days so I don’t feel the need for that extra coverage. When I do wear it I love it. It still feels light on my skin but I know I have that extra coverage. I apply it the same way I do the serum foundation but I only use 1 pump for my entire face. This foundation is also buildable and hides imperfections well! Overall thoughts: I’m really impressed with this company and how they managed to stay true to themselves while still offering great working products to their consumers! Deciem and The Ordinary line are definitely worth the hype. Their price point, products and overall social awareness is refreshing. I look forward to trying out a few other products from them and hopefully will love them just as much as I love these! Have you tried any Deciem products? If so, leave me a comment below. I love hearing from you ! Disclaimer: I purchased these products. They are not PR samples. Have you ever stayed in an upscale hotel or driven in a luxury car and felt that from now on you can’t settle for anything less than this experience? This is how I feel about the Estée Lauder Double Wear, Stay-In-Place Makeup. I truly believe I have found the Maserati of all foundations! Double Wear exudes glamour and luxury and I desperately need it in my life from now on! Double Wear is long wearing, 15 hours to be exact, has a fluid texture, provides medium coverage, very lightweight and gives a semi-matte natural finish. This foundation comes in 3 tones (C) cool, (N) neutral, and (W) warm and has over 30 shades to choose from. I was introduced to the Double Wear Makeup on one of my lunch break visits to Nordstrom. I really wasn’t shopping for a new foundation, but sometimes god has plans for you and you must accept it ( I’m being a bit dramatic I know). The overly exuberant sales lady insisted I test it out and promised me I would be pleased. I had a hard time saying no, so I reluctantly propped myself onto her mini stool and waited while she matched me to a shade. I convinced her to let me take the lead and I applied the makeup the best way I knew how to apply foundation. I warmed the foundation on the back of my hand in circular motions and applied it to one side of my face with a flat brush. I stepped into the light she had setup beside her counter and was pleasantly surprised at the overall natural finish + semi sheen I saw to my skin after one coat. I liked how silky and soft it felt on my skin and how even my complexion looked. I was impressed but wasn’t blown away. I did the other side of my face and told the sales lady, ” I would think about it, I like it but I don’t love it”. Back to office I went with a fresh foundation application. As a coincidence, Ottawa that day hit temperatures of 30 degrees and to my surprise my foundation stayed in place. It didn’t separate, oxidize or become patchy. Actually , it looked better 4 hours after the initial application. I was a bit perplexed as I had never experienced this with a foundation. How is it that it looked better now than when I applied it at noon? I researched this magic of a foundation online and it seems that Double Wear was formulated to provide built in long lasting wear. The longer you wear the foundation, it starts to look better on the skin. My skin looked airbrushed 4 hours after I applied it!I have worn the foundation almost every day since I first purchased it 3 weeks ago and it hasn’t let me down. Final Impressions: I like how soft it feels on my skin and doesn’t dry out my already dry skin.I love the fluid rich texture and I’m very pleased with the variety of shades available. I appreciate how it evens out my complexion and provides great medium coverage. I did have to use concealer on a few areas but this is expected with any medium coverage foundation. At $53 it’s very comparable cost-wise with other brand name foundations, but I believe Double Wear is best value for your money because not once did I have to “freshen up” my face while wearing this foundation. So I never used any powder to prolong the life of my foundation. 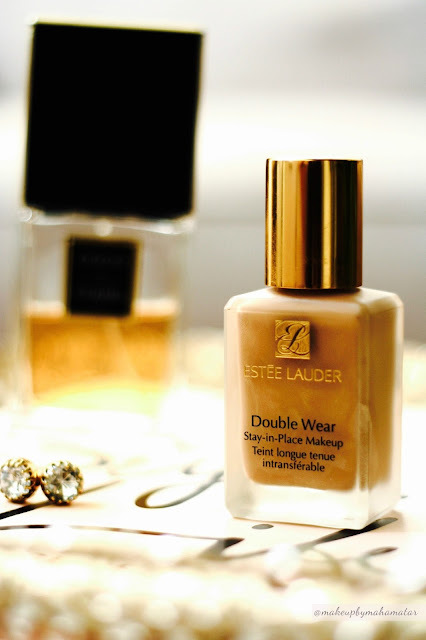 The only setback I have with Double Wear is that it doesn’t have a pump to extract the foundation. I don’t like having to dig into the foundation to get the product. Overall, I can say I have found my HG of foundations! It works so well on my olive toned skin and gives me that perfect fresh, natural and even complexion that I lust after. 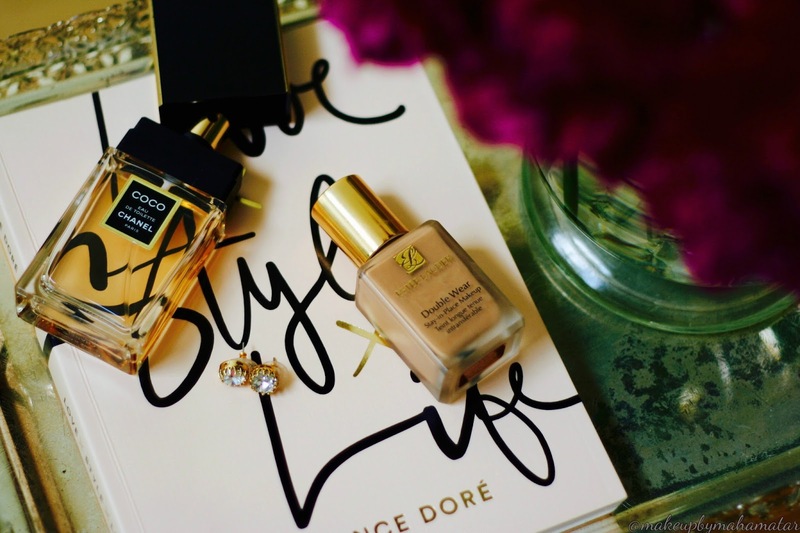 I truly enjoy wearing this foundation as it does add a bit of luxe into my life and who doesn’t want that!